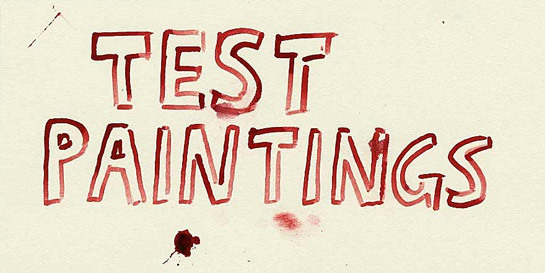 TEST PAINTINGS is Jan Svenungsson’s title for a series of some 140 paintings, begun in 1992. For each painting the point of departure is to be found in a great number of randomly splashed watercolors in various shades of blood red. From this bank of images the artist will select one and use it as a model for an exact translation or interpretation in oil. These TEST PAINTINGS, together with the chimney drawings and –construction projects, as well as the Psycho Mappings, is another long time serial work of Jan Svenungsson of whom Pontus Hulten says: “An artist of the same type as Marcel Duchamp, who evaluated the various ways of being an artist. His works are very consistent, going from step to step, sometimes as difficult to follow as Duchamp´s. Few young artists pose primary questions so clearly and so difficultly. Jan Svenungsson was born in 1961 in Lund/Sweden. He lives and works since 1997 at Berlin. A great number of solo and group shows has made him well known internationally. He recently had a one man show, "Psycho-Mapping the Current Crisis", at Moderna Museet in Stockholm and participated in the group "Norden" at Hamburger Bahnhof, Berlin earlier in this year..